The other day I was thinking about some of my co-workers from a previous job. We've all since moved on from that organization - many of us moved to other parts of the country. One of my co-workers was a young woman named 'Kate' who was about 2 years out of college, was living with her boyfriend and in her first 'real' career job. One day the topic of budgets and paying bills came up. She admitted she had no idea how to balance her checkbook and only attempted when she looked at her statement every month. Now, these days not many checks are written, but when I say "checkbook" that includes anything that comes out of your main checking account; checks, debits on your bank card, debits ran as a credit card on your bank card, online purchases from that account as well as payments made by smart phone and last but not least, cash you withdraw from the ATM. If it comes out of that account, you need to track it. This is especially true today since we've had a rash of recent ID and data theft both online and at retailers like Target. Here is the thing... everyone has to find a process that WORKS FOR THEM. Our brains all think and process differently. What makes sense and works for me may not work for you. But I decided to share how I keep our main checking account balanced and it may or may not be something a reader may be able to use. Kate was thrilled I was willing to share with her how I keep mine; she had never been taught anything about the process of banking and didn't have any process in particular that worked for her. She actually liked the idea's I used and implemented them into her budgeting. I keep the check register with me at all times and write in every time I make a deduction of any type from that account. Whether it's a debit, a check, ATM, online purchase... write it in. Even if you THINK you'll 'remember later' you may not. I check our balance either online, on my smartphone app or by telephone to the automated system almost daily. Check off those that have cleared your account and make sure you have them noted in your register as well. If I make a payment online I will typically write the confirmation number on the second line, under the store or company I paid. For example; if I ordered a photo book from Walmart, I would write Walmart on the white line, photobook #48723CL98 on the second (description) line under it. This way I have the order, date, amount and confirmation number all in one place. FIRST column: Either the check number, or whether it was a 'debit' or 'online' 'deposit' or 'cash' or whatever. THIRD column: Who was it to? What was it for? Is there a confirmation number? FIFTH column: I put a check mark with the date it cleared the account. 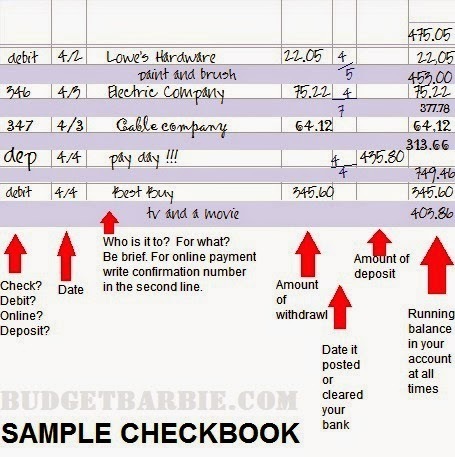 Explanation: When I check my account, if that payment has cleared, I write the date it cleared my bank. account yet, or which checks haven't been cashed yet. know what your balance is so you never have an overdraft. By keeping your account up to date you can usually tell if there are fraudulent charges (data breach or ID theft) immediately and can tackle the problem right away rather than finding out 17 transactions wiped out your whole account over the course of a week.